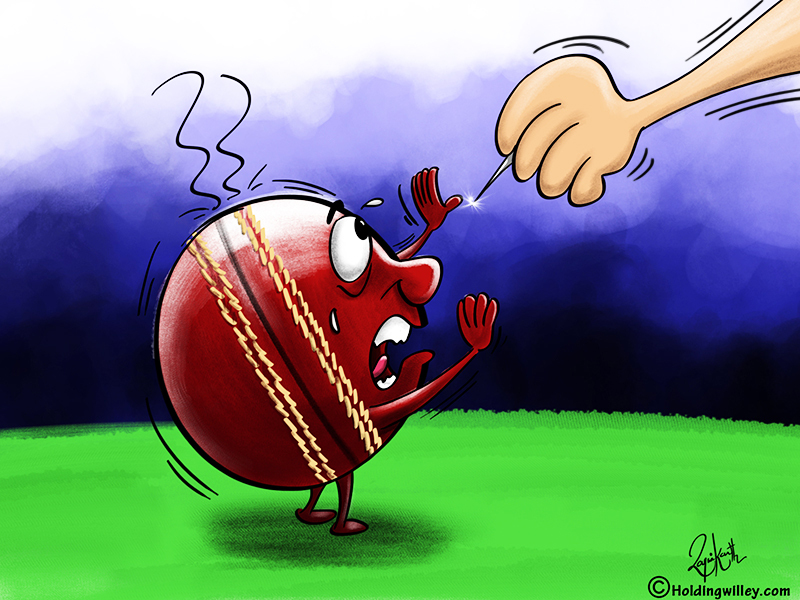 Cricket is called a gentleman’s game, but its history has been replete with many controversial practices, of which a notable one is ball tampering. Time after time, many international cricketers have been caught trying to alter the condition of the ball illegally to make it swing more than it would through normal methods. It has barely been 3 months since ‘Sandpapergate’ and already another incident, involving the Sri Lankan captain Dinesh Chandimal, has taken place. One of the main reasons for repeated occurrences of ball tampering is that it is just a Level 2 offence under the ICC’s code of conduct. There is talk of upgrading it to a Level 3 offence, which would carry a much stiffer penalty with those caught red handed. However, until the ICC show that they are serious in stamping out this offence, there will always be players who commit this transgression. Let us look at 7 prior instances in the last 25 years where international cricketers were found guilty of “scratching, scuffing, or otherwise unnaturally altering the cricket ball”. Atherton, England captain at the time, was caught on camera rubbing dirt on the ball. Law 42.5 states that no player must rub the ball on the ground or take any action to alter its condition. Atherton initially protested his innocence and said that he was not trying to alter the condition of the dry and roughed up ball, but merely trying to maintain its condition. Instead of telling the truth to the Match Referee Peter Burge, he panicked and said that the dust in his pocket was merely to keep his hands dry. He spun a different story to the England management, Ray Illingworth and Keith Fletcher. Burge was apoplectic when he found out it. Burge said that if he had known the true story, he would have suspended Atherton for a couple of Tests. Atherton nearly lost the captaincy because of his indiscretion and was fined 2000 pounds. The second Test between India and South Africa seemed to be petering out to a draw when Mike Denness, the Match Referee, pulled up members of the Indian team for two offences. The first involved vociferous, excessive appealing by as many as 5 players in the Indian team and the second involved charging Sachin Tendulkar with ball tampering. Till that point in Tests, Tendulkar had an unblemished record and such a charge raised the hackles of the Indian fans, media and BCCI, who felt that he was unfairly targeted. When Tendulkar was brought on to bowl he managed to obtain more movement than any other bowler and television footage showed him working on the seam off the ball with the thumb and forefinger off his left hand. When Denness saw the footage, he felt that something untoward had occurred. Tendulkar protested his innocence, saying he was merely trying to clean the ball, rather than trying to alter its condition. Denness fined Tendulkar 75 % of his match fee and imposed a one match ban on Tendulkar, which was suspended for a year. The ban was later revoked and Denness was removed as the Match Referee. The 3rd Test was deemed unofficial. Rahul Dravid has always been considered in India as a thorough gentleman who never resorts to unfair or illegal methods. However, he was caught on camera rubbing a cough lozenge on the shiny side of the white ball. The 3rd umpire, Peter Parker, reported this to the Match Referee, Clive Lloyd. Dravid was charged under Clause 2.10 of the ICC’s Code of Conduct and found guilty of ball tampering. He was fined 50% off his match fee. Till date, this remains the only forfeiture of a game in Test history. Umpires Darrell Hair and Billy Doctrove accused the Pakistan team of ball tampering and gave England 5 penalty runs. The Pakistan team were incensed and refused to take the field after tea. The umpires then awarded the Test to England. The Pakistan team was later cleared of ball-tampering by the ICC and the result of the match was changed to a draw in 2008. In 2009, the ICC reinstated the result of the match to an England win. In 2013, in the second Test between South Africa and Pakistan, du Plessis was caught rubbing the ball against the zip of his trousers. Du Plessis pleaded guilty and was fined 50% off his match fee. South Africa did not contest the charge as they feared a stronger punishment, instead maintaining that contact with the zip was inadvertent as du Plessis was merely trying to dry the ball. In 2016, du Plessis was the South African skipper and was found guilty of trying to alter the condition of the ball using mints during the 2nd Test at Hobart. The Match Referee, Andy Pycroft, found him guilty of ball tampering and fined him 100 % of his match fee, though he cleared du Plessis to play in the 3rd Test at Adelaide. The South African skipper was charged with changing the condition of the ball in breach of Law 42.3’. An update to the ICC’s Code of Conduct meant that the transgression was treated as a first offence even though du Plessis was also found guilty of ball tampering in 2013. Philander was caught scratching the ball with his fingers and thumb and was charged with breaching Clause 42.1 of the ICC’s match playing conditions. He did not contest the charge and was fined 75% of his Match fee. There have been other sporadic incidents and unless the ICC takes this menace seriously, such incidents will continue to happen in future.